Select the job to stop from the Vectorize/Render Queue window and click Delete. The shell window displays all the processes that are active at the moment. 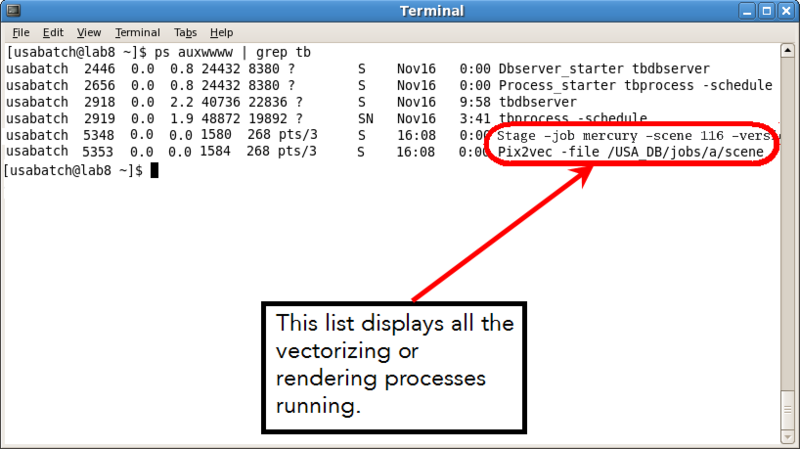 If you started a vectorizing process, look for the process that lists the word Pix2vec -file fileLocation. If you started a rendering process, look for the process that lists the word Stage -job jobName -scene sceneName -version versionNumber. Take note of the system number that identifies the process. In the example above, the system numbers appear in the box on the left. kill -9 5353: Stops the vectorize process. kill -9 5348: Stops the rendering process.